Travel is a part of life for many business people. I use Travelocity online to book most of my travel. There are many, especially sales people, who are on the road constantly. Therefore, it would make sense to have a few good travel apps tucked away to help remove the stress from finding flights, rental cars, and hotels. This is where the Travelocity mobile app comes in. 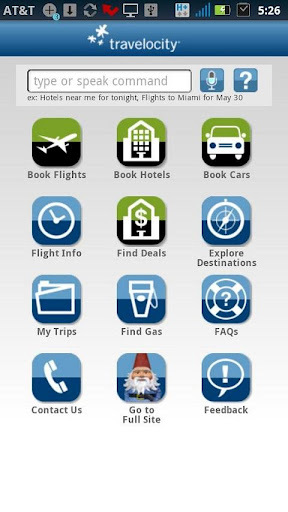 Travelocity has an Android app which allows the user to search and book flights, cars, and hotels directly from your Android device. I’m not going to go over all of the items but just the high points. With this screen you are given a very simple and clean layout. You choose the departing airport and the destination airport, round trip or one way, Depart time, Return Time, and the number of passengers. One nice feature here is that the app suggests airports as you type which reduces the amount of typing you have to do. You are then presented with your flight choices and are able to view the details of each flight before you select it. Once you select your flights you can then log into your travelocity account or book the flights as a guest. Once again you are given a simple screen where you enter all of the pertinent details for your hotel search. After selecting your hotel and room choice you have the option to populate the contact form using your Travelocity account details. You then enter your purchase information and book the room. This function works just like you would expect. You choose your pickup location, date, and time. Then your drop off destination, date, and time. Next Travelocity presents you with your choices of car types and companies. You make your selection and reserve the car. One feature I REALLY like with this app is the ability to speak what you want. For instance, on the main screen I tap the speaker icon and then say “fly to dallas tomorrow”. The flight search page opens with the airport closest to my current location as the From city and DFW as the To city for tomorrow. Then I can tweak any of the criteria if I need to. Travelocity tries to understand what you’re looking for and save you steps by populating the searches. This is a great feature that saves time and effort…especially if you’re in the car when doing it. All in all this is a nice app that doesn’t try to do too much. There are other features that I didn’t go into but head on over to the market and try it out for yourself. • Get Mobile ONLY Exclusive Deals for hotels.